With so many reasons to limit screen-time for all of us (not to mention the particular harms it has for the youngest kids), we aim to minimize videos and similar things in our home. But audio seems fine — music particularly. We play lots of music recordings of all sorts along with making our own music. It started with a book: a children's atlas of U.S. states. My then one-year-old son took interest in the state birds in particular. So, I decided to look up bird songs online. We moved on to our North American bird guide, letting him pick out birds for me to then look up sounds from AllAboutBirds.org, the MacAulay Library, or Audobon online Bird Guide (I'm not anti-technology, this access is simply astounding, I had no resources anything like this when I was growing up). I looked up audio-only options and that went great. He even started letting us brush his teeth with no fighting as long as we played bird sounds at the same time. Then we got a children's world atlas from the library. So, he picked out animals from that and asked for sounds. When he asked about tapir sounds, all I could find were a handful of YouTube videos. I failed to hide the videos from him, and I gave in to letting him watch them. For weeks, he constantly asked for tapir sounds (by which he meant the full videos). I didn't want to watch the same handful of short tapir videos over and over, so we expanded into watching various wildlife documentaries. 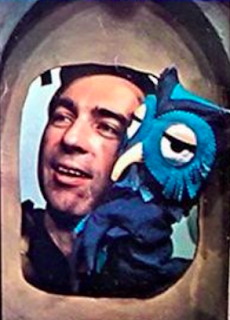 When I saw the new Fred Rogers documentary, Won't You Be My Neighbor?, I was reminded of how wonderful his show was. So, I decided that was okay to add to our modest video watching time. Mister Roger's was an anti-TV television show — the opposite of cartoon "bombardment" (Fred's own wording from his congressional testimony for PBS funding). Fred treated the show with deep thoughtfulness and with love and respect for his young audience. For insight on his process, see his Rules for Talking to Children. The pacing of the show was natural, not gimmicky. It was authentic, human communication; not a spectacle to entertain and distract the viewers. One way to understand how great Mister Rogers' was: read this review of how the newer animated show Daniel Tiger's Neighborhood falls far short in so many respects. Mister Rogers' Neighborhood would have been great enough given the values I mention above, but the musical quality made it that much more superlative. I had vague recollections from seeing the show as a kid myself. I knew that Fred had a music degree and wrote nice, sophisticated, jazzy songs. But watching now, I was shocked to hear absolutely astounding, virtuosic piano playing. Looking into this, I discovered that the show was blessed with live music for every episode — a small band led by Johnny Costa. Johnny even improvised totally different jazz arrangements of the opening theme each time! Now, check out the classic episode on Mistakes. Johnny's playing in the intro is simply superb. He plays marvelous background accompaniment throughout the different scenes as well, including the support for the moving duet with Betty and Fred (as Daniel Tiger). Johnny played dynamically, fitting the music to Fred's natural pacing. If you then play the next episode in the playlist, you'll hear the opening song with a quite distinct piano accompaniment. Johnny mixed it up constantly with amazing variations, somehow all still fitting with Fred's singing. I suggest listening to the openings of several different episodes to notice the contrasting piano in each. Beyond creative and expressive songwriting, I appreciate the artistic intentions. His songs do good in the world. He didn't write them to show off but to share sincere love and wisdom. As I like to put it, his music is expressive — the energy goes outward, sharing a gift with us; rather than impressive (where the energy goes toward the performer, focusing on how talented they are). The same goes for Johnny Costa's piano playing which somehow has no sense of pretension (even though I can't help but be amazed and impressed since I started paying more attention to it). I also love the amount of silence in the show (ironically, the new documentary still plays music over the discussion of Fred's use of silence!). Even though I'm a musician, I often like to just have quiet ambient sounds and silence when I'm done teaching or practicing. I don't need or want constant active stimulation. Fred also presents music as a tool we can all use for communication, enjoyment, mood and time regulation, memory, and more… Music is not just for performing in concert for others. Everyone can and should make their own music for their own purposes. Fred Rogers and Mister Rogers' Neighborhood provide a model toward which we can all aspire. I want to keep that in mind every day as a parent, teacher, and citizen in whatever vibrations I put out in the world. P.S. I've not yet found anything else comparable to Mister Rogers' Neighborhood to share with my son. We might try Sesame Street — it has some fast-paced animations and isn't as transparent about what's real and what's pretend, but I've heard that the 1970's episodes are still quite good (whereas the newer ones are worse in all sorts of ways). Even many newer documentaries have overly-fast cuts, though there's lots of good stuff in that space, notably anything from David Attenborough (especially when written by him, not just narrated — David is as thoughtful as Fred; he's totally the Fred Rogers of nature documentarians, only with a much much much higher budget). I'd be happy to hear from anyone who understands all these issues and has other recommendations for healthy media options.